Consumer Watchdog: Will Herbalife make you rich? No. Will Herbalife make you rich? No. Last week we looked at Amway, one of the world’s biggest Multi-Level Marketing schemes and asked the same question. Will Amway make you rich? Or will it make you any money at all? The answer was simple. No. You won’t become rich by joining Amway and the odds are that you’ll probably lose money if you join the scheme. Maybe you think I’m biased and this all based on my uneducated, ill-informed opinions? That’s certainly what several Amway distributors, or “Independent Business Owners”, “IBO”s have told me over the last few years and in particular over the last week. My opinions are, according to them, ignorant and biased. Actually this isn’t based on any opinions at all, it’s based on the figures that Amway are required to publish every year in the United Kingdom. When the UK authorities tried to close down Amway a decade ago, Amway dramatically cleaned up the way they did business over there and they started publishing an annual “Earnings disclosure statement” that showed how much their recruits actually earned. The latest statement, published in 2016 that covered the year ending in September 2015 made very sad reading. Only one out of almost 40,000 IBOs made more than the average annual wage from their Amway business. The vast majority of them had an income of less than 3% of the average annual wage. And that’s just their income, not their profit. Those miserable amounts are before they paid their internet, phone, electricity bills and their rent. It’s before they bought all the marketing material, attended all the workshops and seminars and before they spent all that time desperately trying to persuade people to join the scheme. The reality is that when these things are considered it’s reasonable to think that almost everyone, probably more than 99% lose money rather than make it from joining Amway. So what about the other Multi Level Marketing schemes. Is it the same with them? For instance, will you make money if you join Herbalife? Will you make money from distributing their health, nutrition and weight-loss products? Will you make money from recruiting other people beneath you if you join Herbalife? Again the answer is no. Like Amway, Herbalife publish a “Statement Of Average Gross Compensation” (441kb pdf download), this time in the USA and guess what, it's the same story. The income most people make is trivial and almost all of the money is earned by just a tiny proportion of the members. 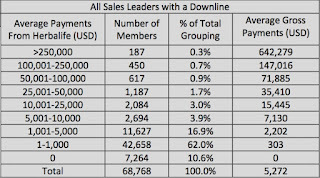 According to their 2015 statement, more than 80% of Herbalife’s members, that's 437,152 people, are just people who buy their products and don't have a "downline". These are the people on the bottom rung of the pyramid. They buy products from Herbalife but there's no evidence they sell it to other people and they certainly don’t make any money. 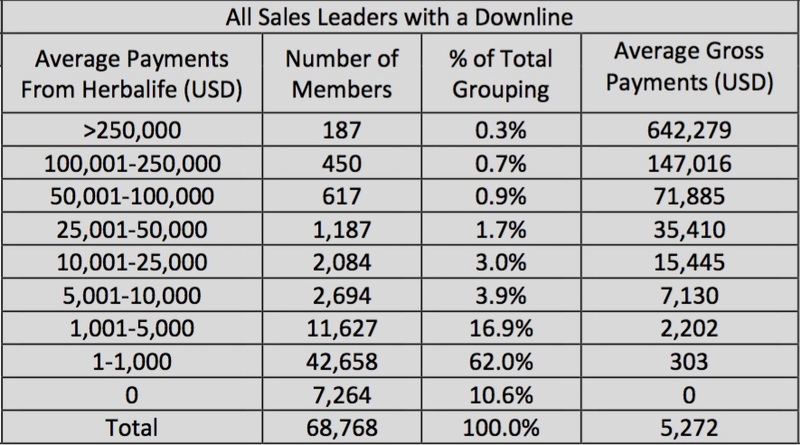 The most interesting group is those people who earned commission from their “downline” sales, the people beneath them. These are what Herbalife refer to as "Sales Leaders With a Downline". In the USA in 2015 there were 68,768 of them. These are the people that Herbalife offer as examples of the riches you can earn from joining Herbalife. But there are no riches. Of these people, three-quarters of all the money was earned by the top 3.5%. The top 10% earned nearly 90% of the cash. At the other end of the scale, the bottom 90% earn just over 10% of the money. The group earning between $1 and $1,000 in 2015 (that's 62.5% of the entire group) actually earned an average of just $303 in the year. And again, like with Amway, that's their income, not their profit. That's before they paid all those expenses, their phone bills, transport costs and their electricity bills. So just like Amway, the chances of anyone making money by becoming a Herbalife distributor are almost non-existent. But that’s not the biggest problem with Herbalife. The problem is that Herbalife distributors can be dangerous. Very dangerous. 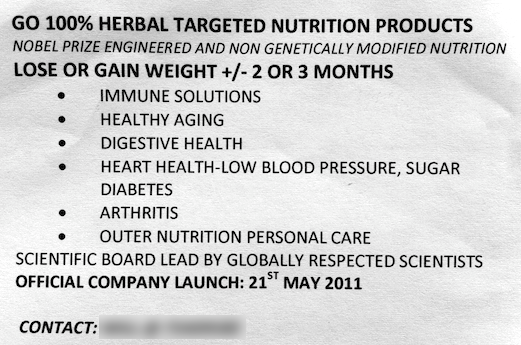 I’ve had conversations with people selling Herbalife products that have included some remarkable claims. One advertised in a local publication that he had solutions to “Problem with asthma, BP, heart, arthritis, face, ulcers, diabetes, weight”. I contacted him and asked if he really could help with heart problems. “Surely”, he said, “We help with reversing heart conditions”. Someone else told me that their products could help with weight loss, weight gain, “blood circulation, back pain and joint, period pains and skin prblm”. Another told me that as well as improving “digestive health”, “heart health”, “dire health threating conditions” and offering “immune solutions”, his products were “very helpful with a lot of various ailement and serious health conditions” and could, get this, improve someone’s CD4 count. In other words he was claiming that his products could help someone with AIDS. These are all incredibly dangerous, false claims to make and guess what? All of the people making these claims were doing their best to sell Herbalife products here in Botswana. I contacted Herbalife on all of these and other occasions and asked them what they felt about the claims their distributors were making. Every time they seemed to be appalled and promised they would to kick these distributors out of their pyramid. But is that good enough? If these claims had been made by just one rogue, delusional distributor then we could probably overlook it. But the fact that this has happened several time and that they’ve told a series of lies about their products suggests something different. One even claimed that their products were “approved” by the Botswana Bureau of Standards, which was nothing more than a bare-faced lie. One last thing about Herbalife. 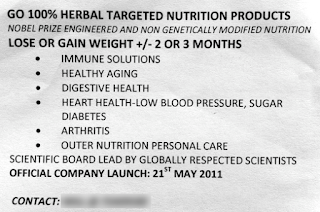 With the exception of pregnant women, the elderly and people with certain very specific medical conditions, none of us need to take the sort of supplements that Herbalife offer. Just buy some fruit instead. My view is that Herbalife is even less appealing than Amway. Amway’s household goods are at least useful. Herbalife? Well, you can guess my view of them by now. Will Amway make you rich? No.